​Join the BIMStorm to learn how. Workshop A will be used to review this diagram and adjust it as needed. This will be the basis for future BIMStorm tasks. 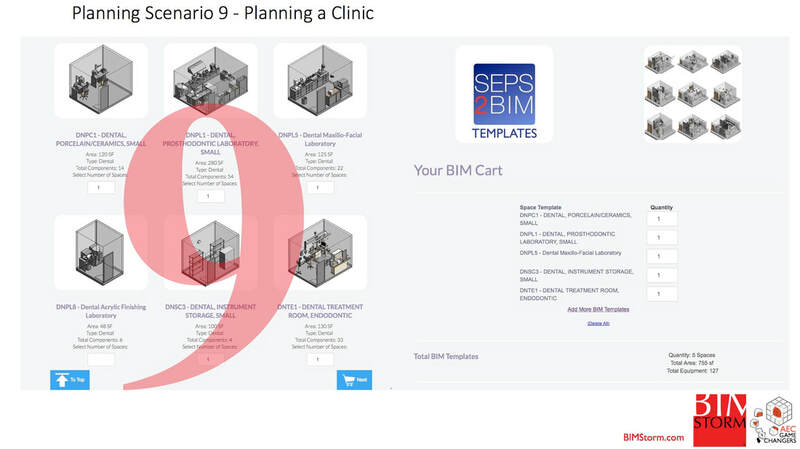 Workshop B is a live training demonstration of how BIMStorm participants can focus in one a specific task and collaborate with others. 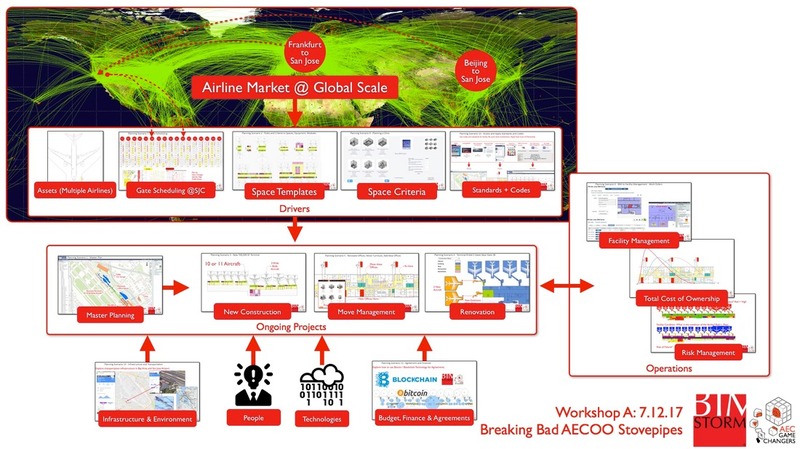 Workshop A questions how the AECOOO industry currently operates. This sandbox has no sacred cows. A wide range of industry leaders will shape scenarios that challenge the status quo. 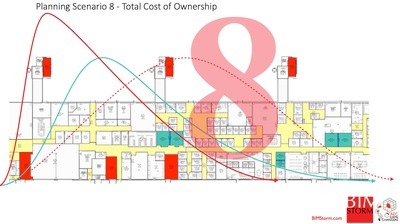 What is the ideal process that enables building informed environments while addressing the needs of projects, total cost of ownership and the life cycle? This leadership workshop lays the foundation for others to enhance during BIMStorm AEC Game Changers 2017. 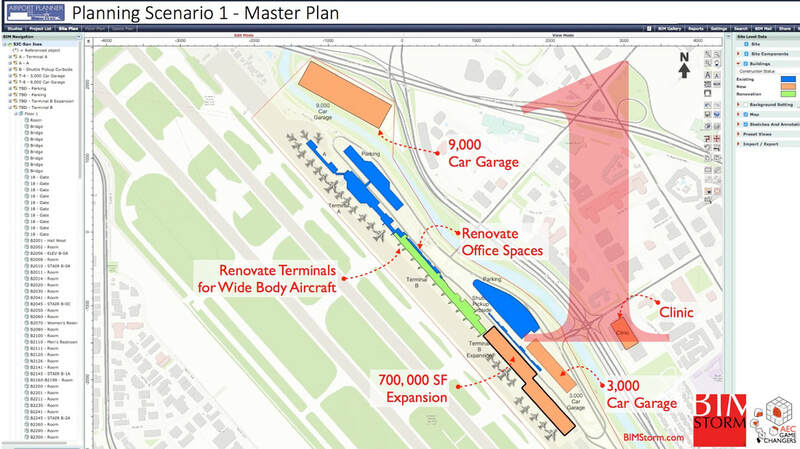 ​Workshop B focuses in on the planning, design, and construction process for a project to renovate San Jose Airport Terminal B and support facilities. Using real, publicly available data, we will demonstrate how task teams can work on their specific projects while collaborating with the entire AECOOO team. Be prepared for online interaction. 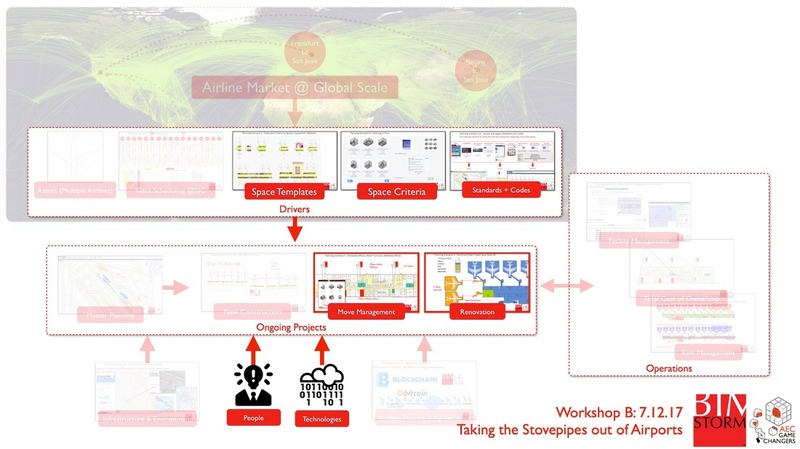 This workshop focuses on airports to lay the foundation for workflows applied to other project types in the BIMStorm scenarios. Presentation of conclusion of Workshops A and B broadcast from Alexandria VA on ARCH-i-TECH.tv. 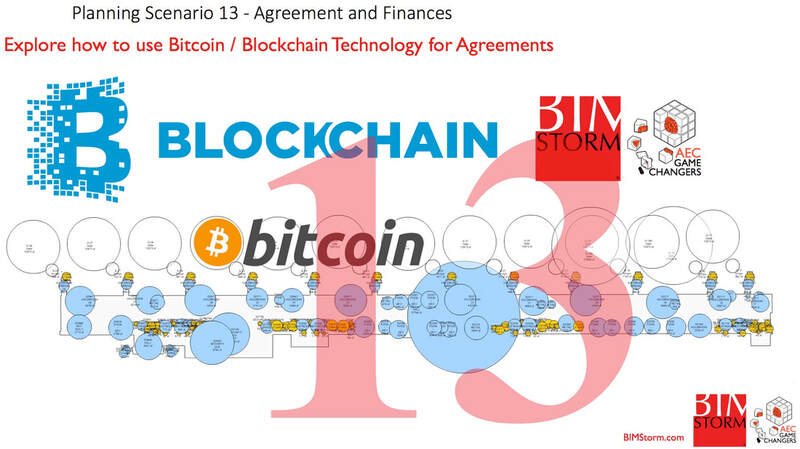 Learn how you can participate in the BIMStorm. 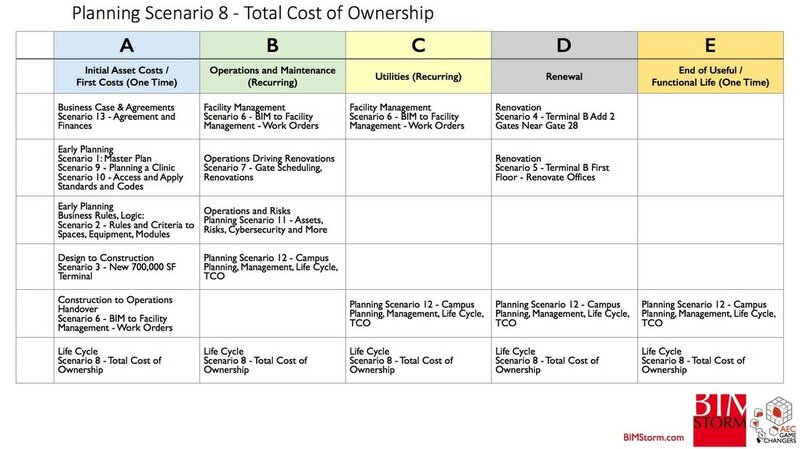 Scenarios have been identified to provide a cross section of activities and things to consider when making asset management decisions that impact facilities. The considerations will evolve over time as adjustments are made and new scenarios are added. Workshop A will review these scenarios. 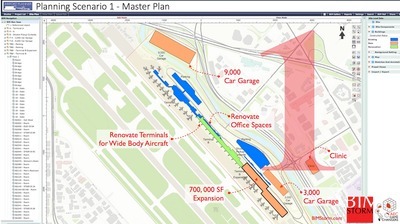 Scenario 1 - San Jose Airport has an ambitious master plan for expansion. A data-driven living master plan adjusts over time as new needs arise. Scenario 2 - This is the DNA of how facilities are put together. The focus is on an airport DNA, but this approach applies to any facility type. Knowledge enabled with technology allows informed decisions to happen and rapid planning. 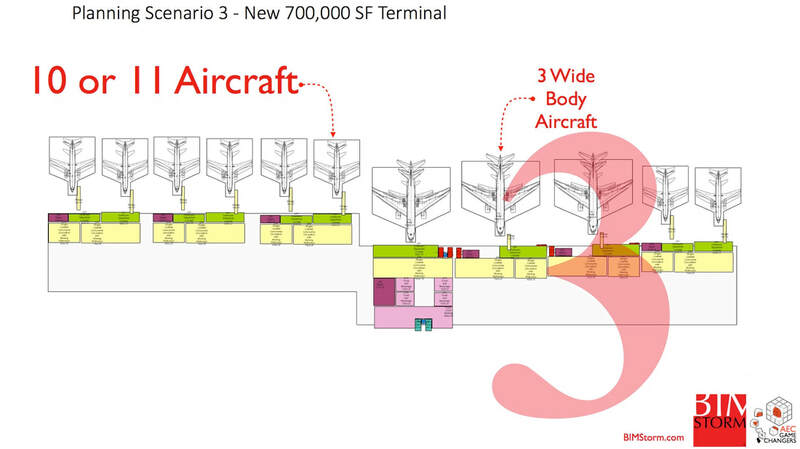 Scenario 3 - A new 700K SF Terminal C will add 10 new gates. Teams will collaborate to evaluate the optimum design and construction and produce data that can be used for the life cycle. 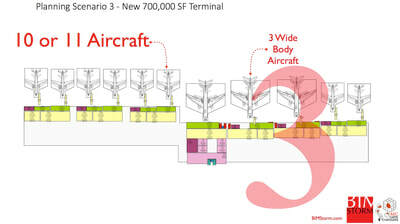 Scenario 4 - Terminal B needs space for two new aircraft and an expansion of holding rooms for passengers. 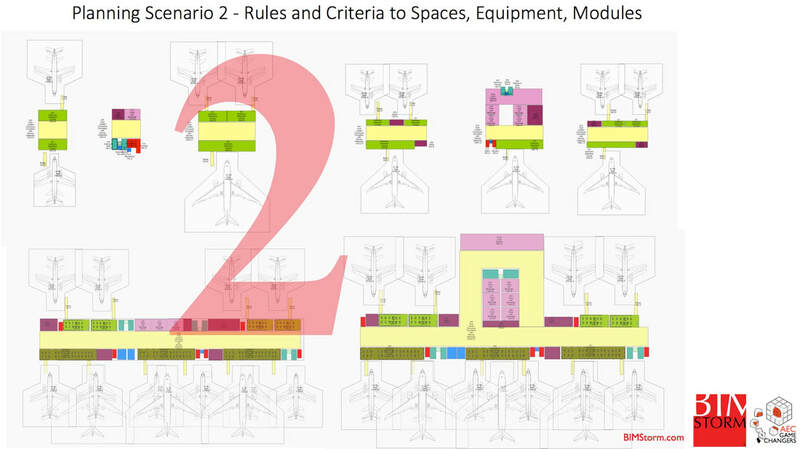 Aircraft types, and clearances drive much of the design and this renovation will study options. 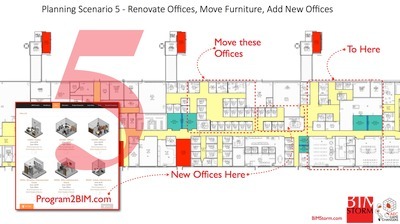 Scenario 5 - Existing facilities go through constant renovation over the life cycle. As changes are needed people and equipment move and spaces are reconfigured. 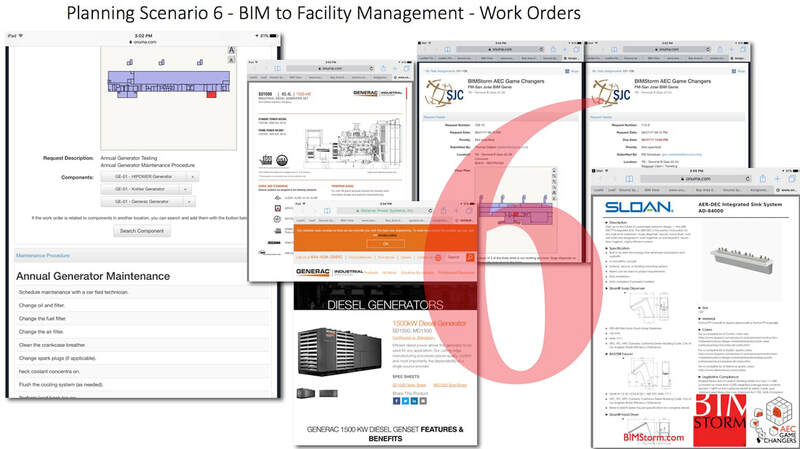 Scenario 6 - BIM produces a huge amount of data, some of which is relevant for facility management. Using standards such as COBIe and owners defining what needs to be managed narrows down the data that should be used for FM. 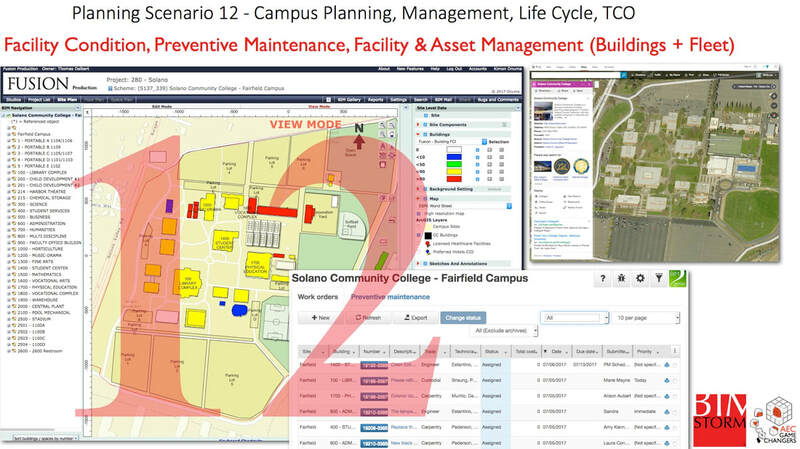 Scenario 7 - Facility needs are constantly changing. Each type of facility has different drivers. 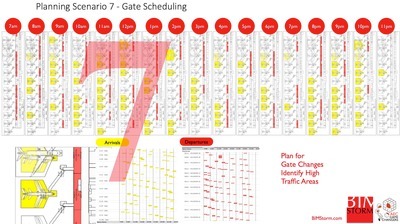 For airports, there is a constant shifting of flight scheduled, new carriers and optimization of terminal support facilities. 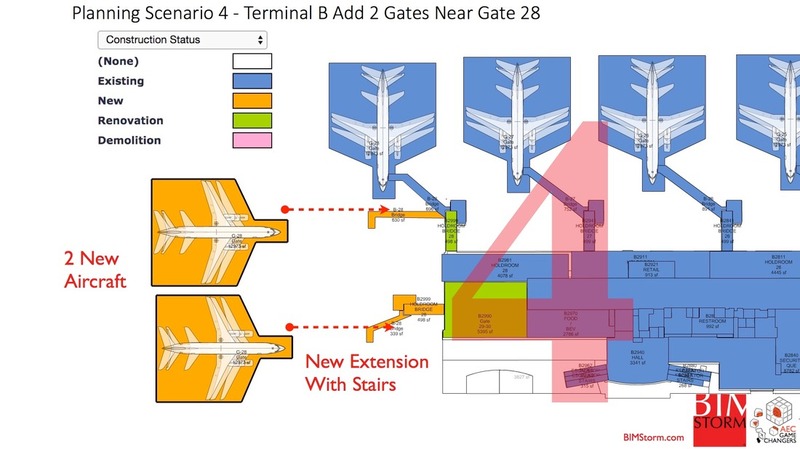 Linking flight schedules to BIM enables this data to help drive decision making for renovations and new design. 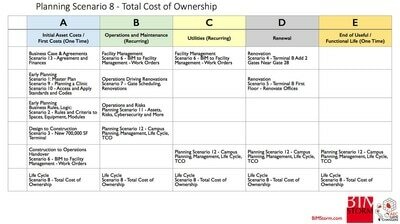 Scenario 8 - Total Cost of Owners (TCO) for the life cycle of facilities goes way beyond the initial design and operations. For existing, new or planned facilities drivers into TCO are linked to the decision making process for facilities. Scenario 9 - Space and equipment data and program requirements drive into design and BIM in real time using SEPS2BIM.org and owner managed project requirements. This is for a clinic but also applies to any other project type. This scenario is a continuation of the BIMStorm last year. 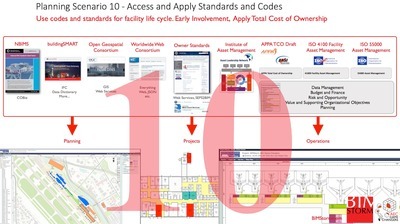 Scenario 10 - Standards, codes, and requirements drive the way a project is completed. Having access to the latest data is currently very painful. 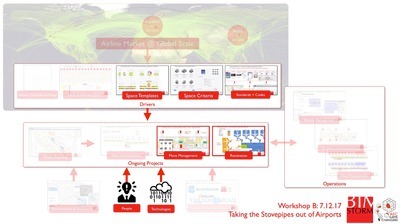 Explore how to use a digital workflow and apply standards to collaborate on projects. 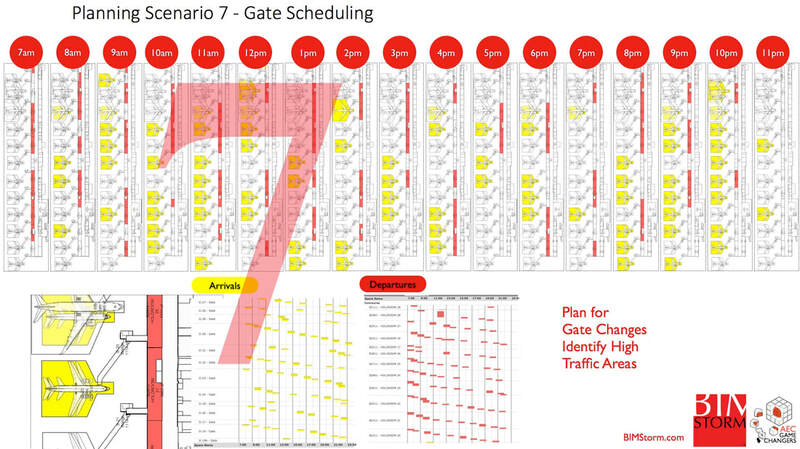 Early engagement of code officials reduces potential problems later in the project. 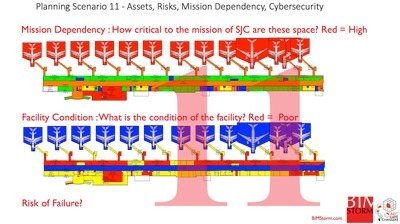 Scenario 11 - Assets, Risks, Mission Dependency & Cybersecurity are part of all project types but are usually an afterthought or missed completely. Earlier engagement of these factors throughout the process of designing, operating and maintaining facilities is the objective. 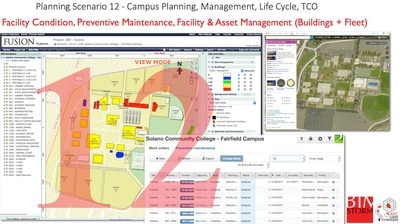 Scenario 1 2 - Campus Planning, Management, Life Cycle, TCO. This scenario will focus on real world data and plans from an actual community college in California. 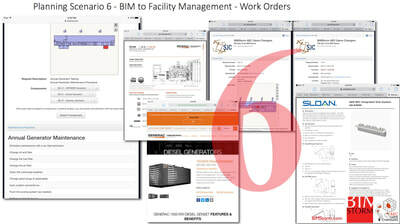 Planning, design, construction, operations, COBie and more. Scenario 13 - What are the business drivers, agreement, finances, and strategies that drive facilities and how can technologies such as Blockchain be used to move them away from analog to a modern format. 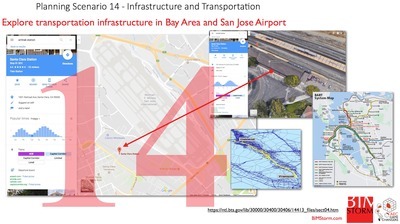 Scenario 14 - Explore transportation infrastructure in Bay Area and San Jose Airport. 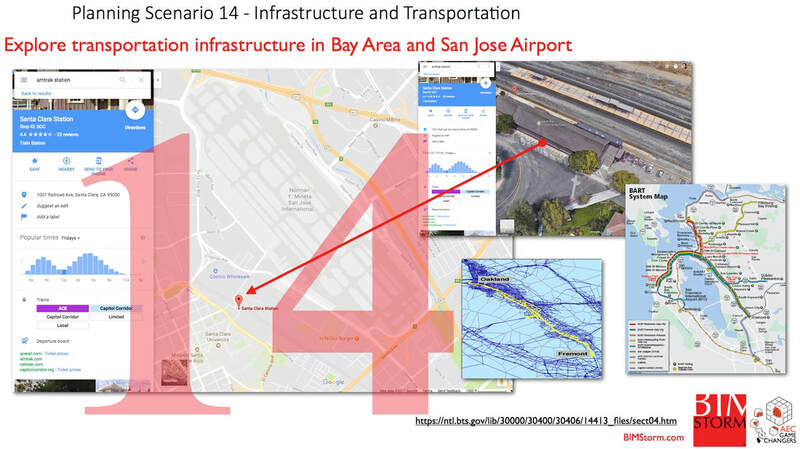 Amtrak, Caltrains, BART, Santa Clara Valley light rail all connect to San Jose Airport. 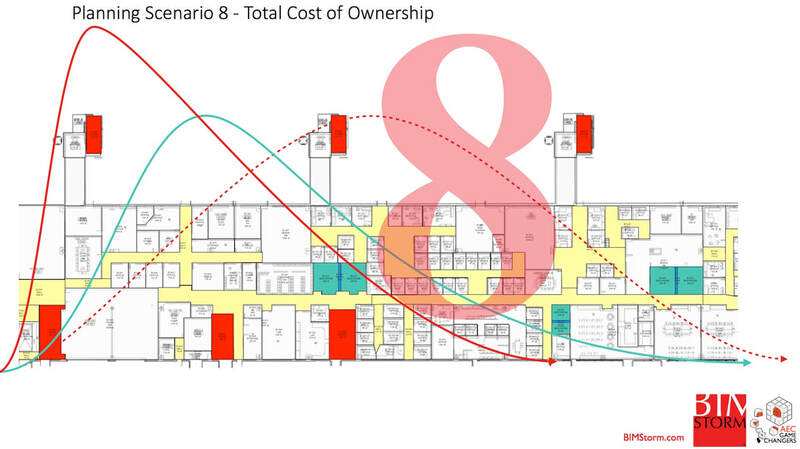 Scenario 8 - The TCO Matrix aligns all the BIMStorm Scenarios to the in development TCO categories.